​​​​Your tissue samples and the time you spend at the bench, are both hugely valuable and limited. To make sure you get the most out of your time, you can learn here about techniques and reagents for tissue clearing. Why clear 3D cell cultures? - Why clear 3D cell cultures? Tissue clearing can help you image thicker tissue sections, or even whole organs, to get more data from each experiment. Tissue clearing or clarifying uses a range of clearing reagents to make a tissue more transparent. Once a tissue has been cleared, it becomes possible to conduct imaging in 3D, which gives a truer reflection of biology than conventional, 2D imaging from thin tissue sections. When understanding the 3D structure of a tissue is critical, the conventional option is to take serial sections and then to reconstruct the structure in silico. This is laborious and requires the careful alignment / overlap of each section against the other sections. Due to the thickness of each section, it also does not provide a complete view of the tissue structure. Tissue clearing combined with 3D imaging gives a complete 3D view of the tissue, without the need for alignment. ​​NeuN antibody ab177487 (green) and DAPI (blue) used with our Tissue Clearing Kit ab243298 to clear and stain a 1 mm thick coronal section of mouse brain. In the last five years, 3D cell culture models (eg organoids, microtissues, spheroids) have been rapidly adopted by researchers due to their improved mimicry of the in vivo microenvironment and, thus their improved predictive capability compared to traditional 2D cell culture models. However, one of the problems with 3D cell culture models in research has been their characterization. Dissolution-based assays lose the spatial features that make these models intrinsically more valuable. Imaging-based assays are incapable of imaging the entire 3D model. The reason that imaging-based assays are limited is because light attenuates after 1–3 cell layers in 3D cell culture models and thus imaging techniques (widefield, confocal) tend to only characterize the cells on the periphery of these models. Since peripheral cells are most exposed to compounds and nutrients, they do not represent the whole model, and often exhibit a very different response to compounds than the average cell within the model. While optical sectioning solves issue of light attenuation and scattering, this only provides information about single planes of a 3D model. ​​Albumin antibody ab207327 (yellow), CD68 antibody (green), Vimentin antibody (red), and DAPI (blue) used with 3D Cell Culture Clearing Kit ab243299 to clear and stain a 3D hepatocyte cell culture spheroid. Recently developed tissue clearing methods, such as CLARITY, CUBIC, i/3/u/vDISCO etc, have been used to produce beautiful images that push the boundaries in fields such as neuroscience and developmental biology. Setting up tissue clearing can, however, be intimidating. It can also be hard to work out which fixation, label, imaging method and microscope objective to use for your specific imaging experiment. Our tissue clearing kits and reagents are designed so that you can set up tissue clearing easily and clear tissues, or 3D cell cultures, quickly. The protocols are simple, use standard laboratory equipment, and are compatible with immunostaining, fluorescent proteins, and chemical dyes. Clearing is reversible so you can section your tissue for conventional H&E or IHC staining after 3D imaging. 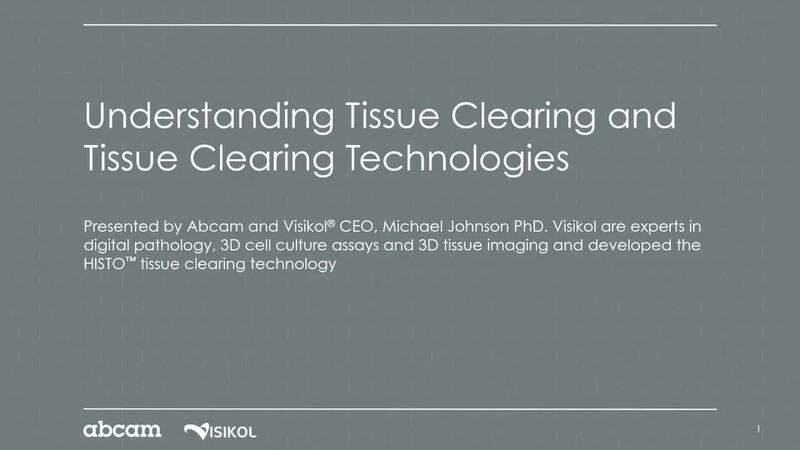 The tissue clearing reagents were developed with Visikol Inc, who are experts in digital pathology, 3D cell culture assays and 3D tissue imaging, and developed the Visikol® HISTO™ tissue clearing technology which is the basis of our reagents. ​​​GFAP antibody ab7260 (green) and DAPI (blue) used with our Tissue Clearing Kit ab243298 to clear and stain a 1 mm thick coronal section of mouse brain. To help you get started with tissue clearing, we have tissue clearing validated antibodies for key markers, such as NeuN, GFAP, and Iba1, etc, as well kits for tissue clearing and kits for clearing 3D cell cultures. Antibodies are tested with 1 mm mouse brain sections, neuronal spheroids, and hepatic spheroids (depending on the marker). To learn more about how to set up tissue clearing using our tissue clearing reagents and understand more about the method, review the Tissue Clearing Kit ab243298 or the 3D Cell Culture Clearing Kit ab243299 If you want to set up tissue clearing on a sample type that we haven’t tested or to use your own antibodies, please consult the protocol book for these kits.